Last Friday the preschool students came to mass with all the other students at school. No one gave any warning, but I tried to make things as simple and short as respectfully possible. It turns out that one little boy was quite anxious to go after about 5 minutes. “When will it be over?” he asked his teacher. “There’s just four more songs,” she replied. After each song he’d ask how many more were left. When he was down to one song, we had just finished with communion, and there’s usually a moment of silence. I like to sit down and close my eyes and pray a little. Apparently, upon seeing me do this, the little boy threw his hands up in the air. “Now he’s taking a nap!” he cried in dismay. Another day, I was praying in the chapel at school while we had a special time of adoration of Jesus in the blessed sacrament. Each class took their turn in the chapel. 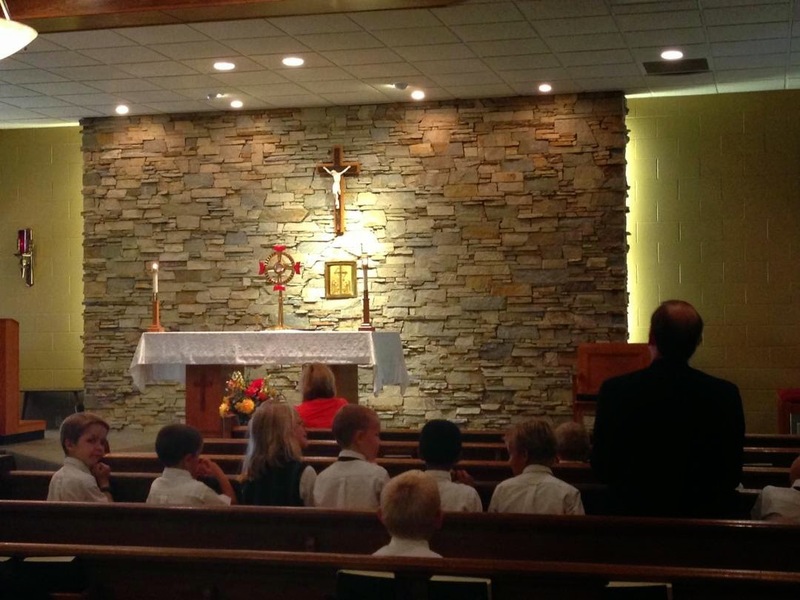 The first graders, all 20 of them, marched right up close to the altar. Their teacher had them kneel on the step. Then they prayed two decades of the rosary. First she asked them what they wanted to pray for. Each one got to lead a Hail Mary. Then she told them to find a quiet place in the chapel to pray on their own. I had my eyes closed again, but soon there were noises all about. It turns out a bunch of the first graders wanted to pray with me! Someone even got a picture. So as a priest, you get both worlds. Sometimes you’re the hero, and sometimes you’re the… uh… guy who takes a nap! Either way it's a joy, and I still love being a priest!